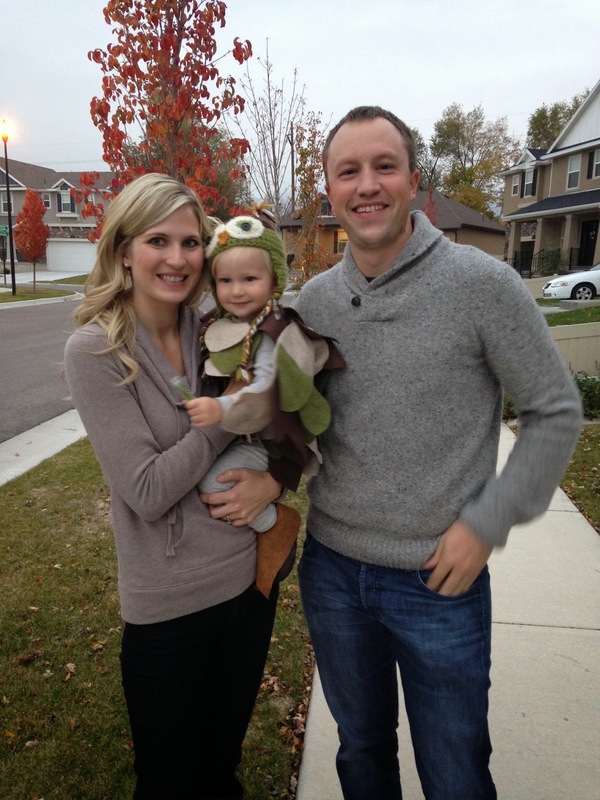 This year was Liam's 1st trick-or-treating experience! I had been thinking about it for months before, trying to decide what he would be for Halloween! 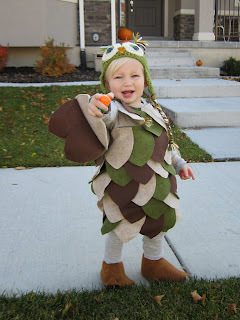 I really wanted to hand-make his costume, but considering I am not an incredible seamstress by any sense of the imagination, I knew it needed to be relatively easy. I procrastinated and stressed about it until 2 weeks before, when I finally decided he was going to be an owl! I looked to Pinterest to get some inspiration, and took what I liked from a few different costumes to ultimately make Liam's. I don't have a tutorial to share, because I am awful at giving directions. In simple terms, I cut all the "feathers" out of felt and then sewed them onto a onesie. 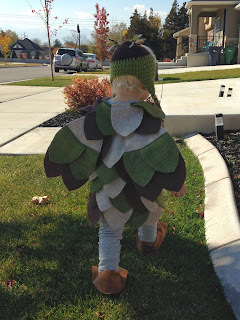 Conor also helped with the costume; he made the wings (two pieces of felt) and the shoe coverings. The hat was made by my friend Jessica, who gifted it to him last year (he has outgrown it a bit, but worked for the night). 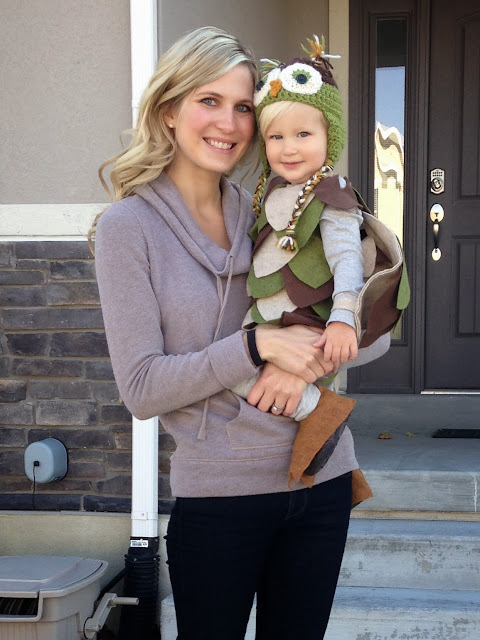 The whole costume cost me only $18 ($10 of felt & $8 for the onesie & leggings which were from H&M). I absolutely loved how it turned out!!! I just couldn't handle the cuteness of him running around with wings & feathers flapping! He didn't love the costume at first, so we put him in it for a few minutes each of the two nights leading up to Halloween so that he got used to it. Come Halloween, he totally ignored the fact that he was in it and even kept his hat on most of the time! We had such a fun filled day; it was everything I was hoping for & more! 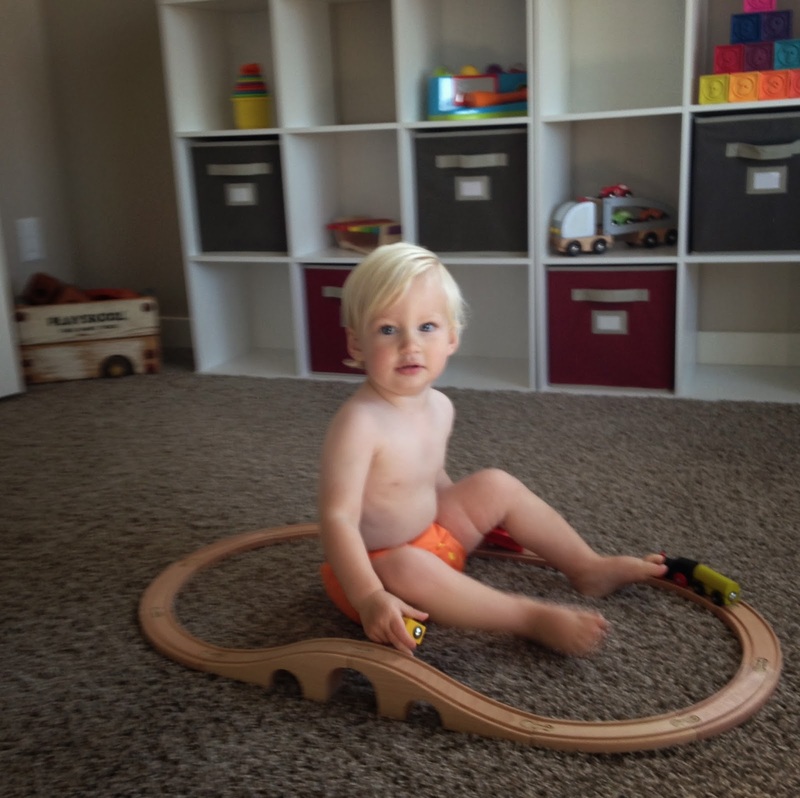 We spent the morning lounging around in our festive orange diapers! I always try to have Liam's diapers coordinate with the holidays; if I had festive underwear I would do the same! We kept things pretty calm & quiet that morning, since I knew the afternoon & evening were going to be filled with fun & kid-chaos! After our Jamba treat (by the way, I love their new color-changing kid-straws! ), we headed to the downtown library & public safety building for a little early trick-or-treating! I wanted to get as much use out of his costume as possible, so we had to go show it off everywhere! Both boys quickly picked up on the whole trick-or-treating business and loved being able to choose a piece of candy at each of our stops. Liam liked to hold the candy in his hands, but once they were too full he had to make the big decision of which candy to put in his pumpkin bucket so as to free up a hand! The library let the kids choose a Halloween book (how did they know how much Liam loves books?! )...it was a big toss up between Scary Stories or Goosebumps... Liam will appreciate it a few years from now. The weather was warm & sunny, so before we left downtown we spent some time just running around in the leaves! We got stuck in some serious traffic on the way, which was a little stressful! Luckily, I had Liam's Halloween candy to keep me happy 'til we got home! 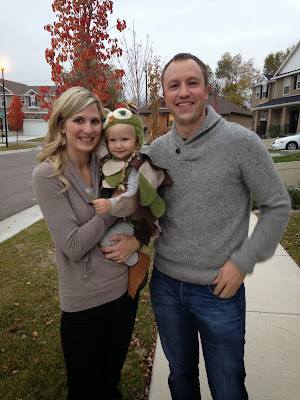 That night we had pizza with the neighbors before doing some trick-or-treating in our neighborhood! I loved watching Liam crawl up the steps to each new house and ever so carefully choose the perfect piece of candy (after hovering his little hand over the bowl for a good 15 seconds). Once our little boy had exhausted himself, we sat on our porch to hand out candy for an hour before putting him in the tub. 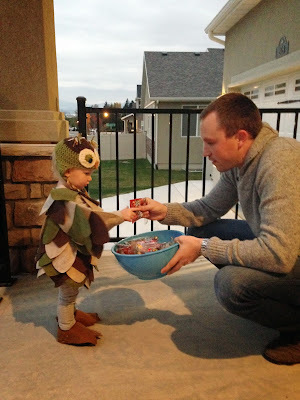 He loved being in charge of the big bowl & "organizing" all the candy in between trick-or-treaters! It was such a special day filled with lots of smiles; I live for these days! That night, we tucked him into his Halloween pajamas (which he'll probably live in until we get new Christmas PJ's on Thanksgiving Night!) and we hoped that maybe, just maybe he would sleep ever so soundly after such a busy & fun filled day... Well... he didn't; but we still love him! 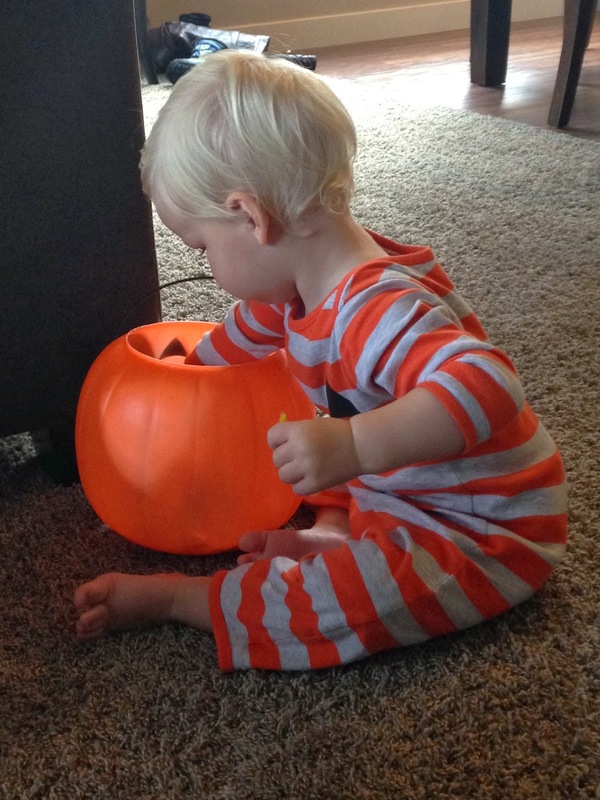 The next day he spent hours playing with all his candy & his Halloween bucket! Put the candy in. Take it out. Run around the room with as much as I can possibly fit in my hands. Put three handfuls in the laundry basket (to be found a couple days later...). Put some in the garbage. Put some in the tub. Ask for help because I can't reach said candy in the tub. :-) This holiday we created so many memories. I already can't wait for next halloween and to see what costume we come up with for him... Never hurts to get an early start on brainstorming...! That costume is amazing! What a sweet little guy you have! Thank you! I am so proud of how it turned out! Omg they look soo adorable together playing in the leaves!! You did a great job on the costume!! Kudos! I'm so impressed that you made Liam's costume!! It turned out so cute! Sounds like a great first Halloween! Thanks! I have an ever so small crafty side! Welcome to our little piece of the world! Liam looked ridiculously cute in his costume! Hats off to you for making it! Aren't you loving this age?? They are the perfect mix of fun and sweet. As much as I miss having a squishy newborn man oh man, Abigail and I have so much fun together.. Thanks! And this age really is the best! Liam has become my friend and I love all our little adventures! Visiting from the Five for Friday link up. Loved finding your little blog. 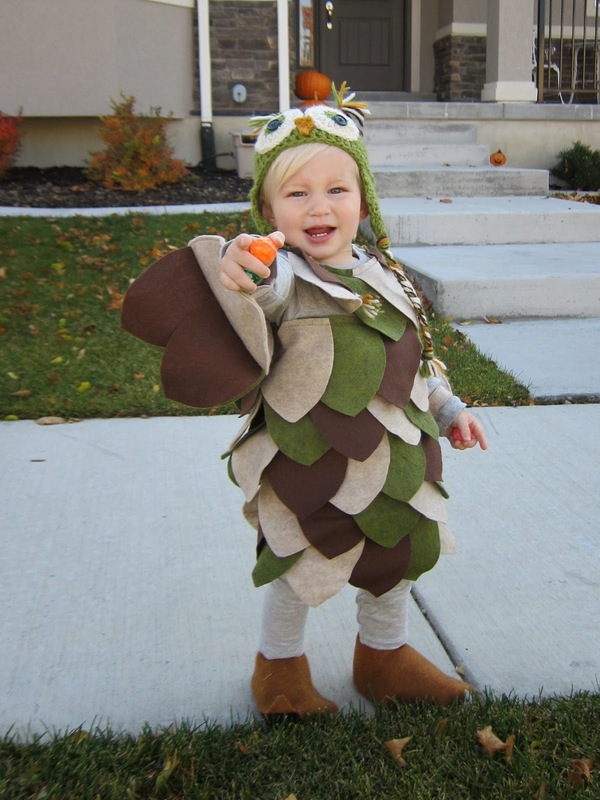 That is the cutest darn owl I've ever seen!